Swansea City's Joe Allen says he hopes the Football Association of Wales changes its stance and supports the Great Britain Olympic football team. The FAW has reiterated its opposition to the team but Allen has joined Gareth Bale in voicing his wishes to play. "If there's a green light it's too good an opportunity to miss," said Allen. "I would be thrilled to get the opportunity to be part of it - especially since the Olympics will be in Britain. "It's a special occasion that I'm sure many players would want to be part of." Great Britain have decided to enter the men's Olympic football competition for the first time since the Rome Games in 1960. Ever since the decision was made, the football associations of Wales, Scotland and Northern Ireland have expressed their opposition. Despite assurances from Fifa, the nations are concerned that selection of their players will undermine their independent status in the international game. Cardiff's Millennium Stadium and Hampden Park in Scotland are set to host football matches at the 2012 Games, but England is the only country willing to give their players permission to turn out at the Olympics. The FAW has not clarified if its opposition to participate in the GB team means it will try to block any Welsh player from accepting an invitation to play. In January, FAW chief executive Jonathan Ford said they had not yet been approached by a player wanting to feature at the Olympics. "Let's take one step at a time and if we get to that we will have the discussion at that time," said Ford. But with Allen now joining fellow Wales internationals Bale and Aaron Ramsey in expressing a desire to play at the Olympics, and with Pearce beginning to consider his selections, the FAW's stance could soon be tested. Despite saying he would relish playing at the Games, Allen stopped short of saying he would play against the FAW's approval. "There's obviously two sides to it," said Allen, who starred in Wales' Euro 2012 qualifying wins over Switzerland and Bulgaria. "The FAW's independence is very important and they might fear that that might change [if they support team GB]. "Some things need to be sorted out and we'll just have to wait to see what the verdict is." 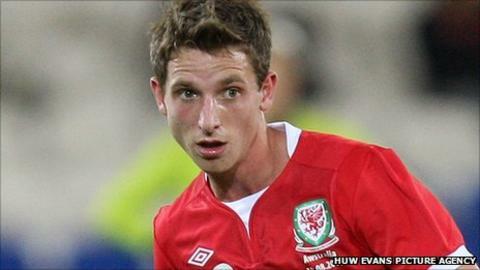 Allen's manager at Swansea, Brendan Rodgers, said he would encourage the 21-year-old to play at the Olympics. "In relation to the [home nations football] federations they'll have whatever agendas or whatever ideas they have for not allowing the players [to compete]," said Northern Irishman Rodgers. "But certainly from my own perspective I think it's fantastic that we can get a team in there and if there's a good balance and top players in the team then fantastic, it'll be a great experience for them."